The two week Football Camp provided an opportunity for the children of the Community Sports Program in Bhubaneswar to learn about the global game, and further refine their soft skills. Pro Sport Development (PSD) organised a Football Camp supported by the Fare Network from 4 - 14 June 2018 as a part of the Annual Summer Camp supported by Tata Trusts, a component of the Community Sports Program in Bhubaneswar. This camp helped the children learn the nuances of football, further develop their soft skills as well as helped prepare them for the upcoming Mixed Gender Football Tournament. The PSD coaches Bhakta Mohan Swain, Subra Sarita Rout and Swagatika Khatei oversaw this training camp along with Hindu Kumar, an AIFF ‘D’ (All India Football Federation) License football coach from Anantapur Sports Academy, Andhra Pradesh. The football camp kicked off with the children learning basic passing and dribbling. As the camp progressed they moved onto ball control and shooting. This camp served to promote teamwork, leadership and equality among the children as well as providing exposure to these children with a platform for them to make new friends. 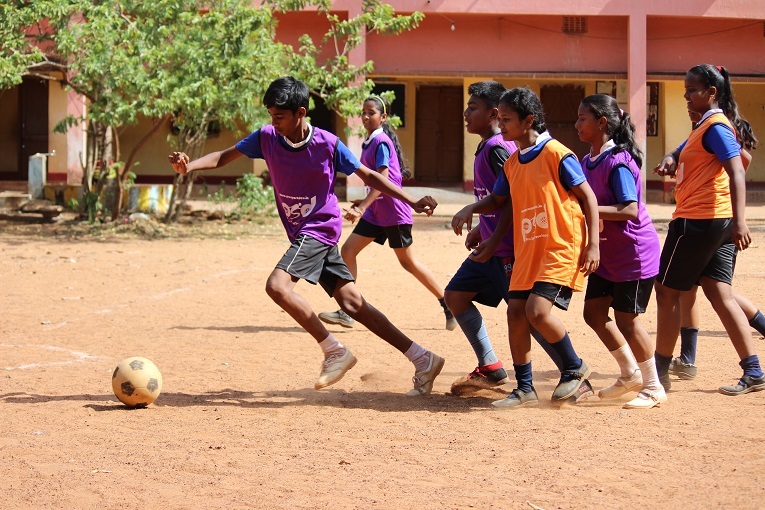 The football camp was held in six schools in Bhubaneswar, reaching out to 72 girls and 112 boys. “The children are at a basic level now. With the right guidance they can be really good footballers as all of them are naturally very fit and athletic”, said Hindu Kumar, who was quite impressed with the children as they showed a genuine interest to learn. “I didn’t like football in the beginning, I always thought it to be a boys’ sport, but after this camp I’ve started loving it and I love scoring goals”, said Nivedita Mohanty, a class 5 girl from Satya Sai School. The Football camp promoted the importance of mixed gender sports and teamwork; also each team in the tournament will have both girls and boys as teammates. “I love playing football. This camp really helped me work on my game. I hope to one day play like Sunil Chhetri”, said Rishav Swain a class 6 student of Saraswati Shishu Mandir, who dreams to take up the sport professionally and play for India in the future. “This camp has really helped me bond better with my classmates. The bonds forged on the playing field while we play as a team are much stronger than those which can be made in a classroom”, said Sunil Rout, a class 5 student of Binabharati Vidya Mandir. This is quite true as the camaraderie shown by these children in the field was really impressive. The qualifiers for the Mixed Gender Football Tournament are ongoing and will be completed by 29 June. 16 teams from the qualifiers will proceed to play in the finals on 30 June, which would culminate the 2018 edition of PSD’s Annual Summer Camp in Bhubaneswar. As the training camp ended, the children are starting to buckle up for the tournament, which would see them representing their respective schools. The teams include students from Satya Sai School, Saraswati Sishu Mandir, Vivekananda Siksha Kendra, Binabharati Vidya Mandir, Saraswati Sishu Vidya Mandir, and Vivekananda Siksha Kendra (PP), all part of PSD’s Community Sports Program, supported by Tata Trusts. The final tournament will take place in the Saraswati Shishu Vidya Mandir grounds. With the FIFA World Cup on in full swing, this tournament will be a perfect opportunity for these youngsters to ‘rejoice in the beautiful game’.